Stop by the Smithfield's Ham Shop for traditional country cured hams, finely cured and delicately aged prosciutto, honey cured hams, as well as favorites from the smokehouse including dry cured bacon, smoked turkey, and delicious country sausage. They also carry many other Johnston County Products, gift baskets and Goodness Grows of NC products. For over 60 years and across two generations of renowned curemasters, Johnston County Hams in Smithfield, have hand crafted "cured" country hams inspired by the techniques used by America's early colonists. 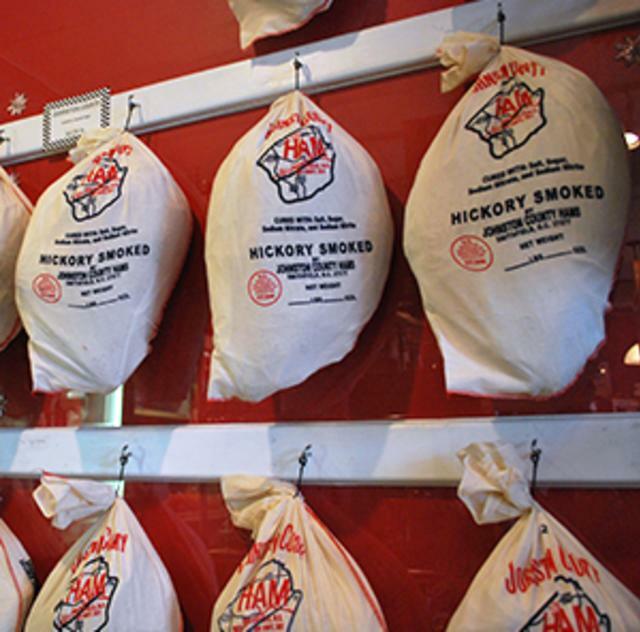 Recognized by many as the best ham in America, their country hams have been featured in Esquire, Southern Living, The New York Times, Wine Spectator and many other publications. Men's Journal has proclaimed their country ham among the "100 Best Things To Eat In America."